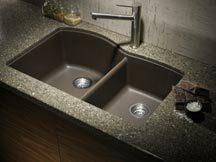 For your convenience Edge Stoneworks is proud to offer a variety of high qualitysinks at very competitive rates. 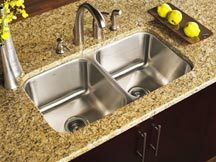 One of the greatest advantages of having Granite or Quartz countertops is ability to install an Undermount sink! Of all the areas in your kitchen or bath, the sink gets the mostuse. So, it’s important to consider its design, function, and quality. 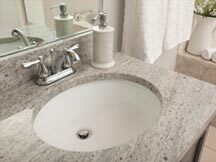 These Undermount sinks install beneath your granite or quartz countertops to create the look of an integral basin. They complement both traditional and contemporary cabinet designs. Our stainless steel sinks are known for their superior quality, and their eight point sound dampeningsystem. We offer 18, 16, and 15 gauge stainless steel sinks with a high luster brushed satin finish, a fullundercoating, are UPC and IAPMO tested and certified, and have a full lifetime limited warranty. BLANCO has been a world leader in quality, innovative design and unsurpassed attention to detail. It’s just a part of our commitment to quality and to our customers to offer high grade attractive sinks at competitive rates. No longer are sinks used simply for function. These days the sink can be the focal point of the room, or even the home. The term “Vitreous China” refers to ceramic materials (like porcelain) that have been glazed with vitreous enamel and can also be used to refer to the actual enamel coating. The high gloss enamel is highly durable, sanitary, and it creates a stain resistant surface.